Suitable for high temperature sintering in vacuum or atmosphere of copper tungsten alloy, Alnico permanent magnet, NdFeB, carbon fiber graphitization, carbon-carbon composite material, silicon carbide product, tungsten and molybdenum and other alloy materials. It can also be used as heat treatment of other metal materials And weather deposition. Use a reasonable vacuum unit to meet the vacuum sintering process requirements. Configure intelligent temperature control instruments, can be free to set the 148-step temperature curve, high temperature control accuracy, can automatically follow the program temperature. The use of high-efficiency medium frequency power supply and induction coil, large output power heating rate, high temperature. Furnace atmosphere controllable, uniform temperature, the furnace can be accessed through hydrogen, nitrogen, argon and so on. 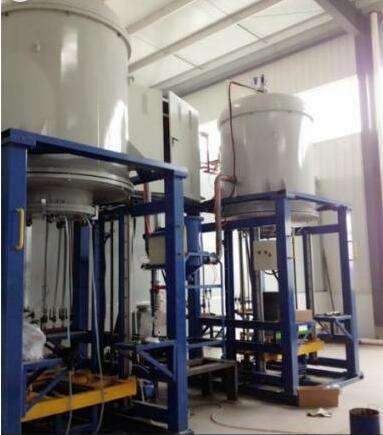 Degassing device can be attached according to the process.